Howdy, forex friends! Canada will be releasing its retails sales report this Thursday (Jan. 25, 1:30 pm GMT) and its CPI report on Friday (Jan. 26, 1:30 pm GMT). And if you need a quick recap on what happened last time, as well as a preview on what’s expected this time, then today’s Event Preview is just for you. 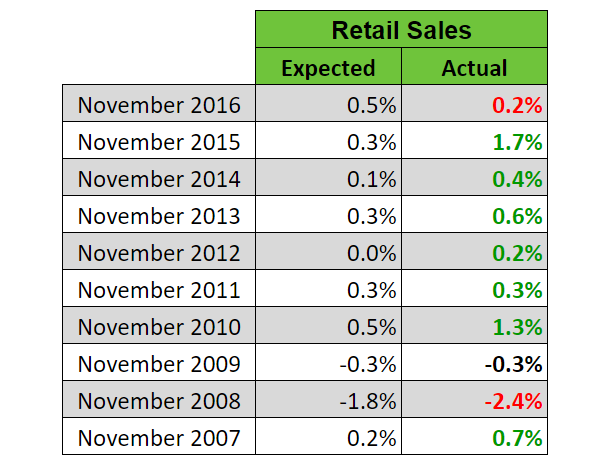 Canada’s October retail sales report was great overall. To be more specific, headline retail sales surged by 1.5% month-on-month, greatly exceeding expectations for a softer 0.3% increase (+0.2% previous). The strong headline reading was due mainly to higher vehicles sales. Even so, 7 of the 11 retail store types reported higher sales in October, which is why the core reading also surprised to the upside by coming in at +0.8% (+0.4% expected, +0.4% previous). For the upcoming November retail sales report, economist project that headline retail sales only grew by 0.8%, slowing down from the previous month’s impressive +1.5% reading. However, the core reading is expected to grow by 0.9%, which is a tick faster compared to the +0.8% reading printed previously. There’s therefore an implied consensus that non-vehicles sales strengthened but vehicles sales weakened in November since vehicles sales are stripped from the core reading. Okay, let’s now take a look at the leading and related economic indicators. Canada’s November jobs report shows that employment in the wholesale and retail trade industries increased by 38.8K. And the December jobs report showed that payroll numbers in the wholesale and retail trade industries grew further by 3.9K in December. Canada’s November trade report shows that imports of motor vehicles and parts rose by 5.4% in November. Imports of motor vehicles actually fell by 0.3%, but this is a weaker fall compared to the -9.0% decline reported previously. Also, the 14.7% increase in imports of tires and other vehicles parts more than made for the shortfall in vehicles sales. The November trade report also shows that imports of all consumer goods jumped by 2.2%, a much faster rise compared to the 0.9% increase reported in October. Overall, the leading and related economic indicators are pointing to a potentially stronger increase in consumer spending since imports of consumer goods ramped up while wholesale and retail trade industries expanded their payroll numbers. This is in-line with expectations that the core reading will improve. However, Canada’s trade report also shows that imports of vehicles weakened but this was more than offset by higher imports of vehicle parts, which points to stronger vehicle sales, which is contrary to the implied consensus that vehicle sales weakened in November. How about historical tendencies? Do they offer additional insights? Well, economists apparently have a strong tendency to undershoot their guesstimates for both the headline and core readings. Just look at all the better-than-expected readings below. In summary, leading and related indicators are pointing to stronger consumer spending in November. Moreover, Canada’s trade report showed a surge in imports of vehicle parts and the slide in vehicles imports in November was weaker compared to the slump in October to boot. This implies that vehicles sales also picked up, which is contrary to the implied consensus that vehicle sales weakened in November since the consensus is that the core reading improved while the headline reading deteriorated. As for historical tendencies, they show that economists have been historically too conservative with their guesstimates. This has resulted in a lopsided number of better-than-expected readings for both headline and core readings, which also skews probability towards upside surprises for both readings. As usual, however, just remember that we’re playing with probabilities here, so there’s also still a chance that the readings may surprise to the downside. Canada’s headline CPI rose by 0.3% month-on-month in November, which is faster than the previous month’s 0.1% uptick, and is also a tick faster than the consensus for a 0.2% rise. Year-on-year, headline CPI surged from +1.4% to a 10-month high of +2.1%, beating expectations that CPI would rise 2.0% annually. A closer look at the CPI report shows that the inflationary pressure was broad-based since 5 of the 8 major CPI components saw increases on a monthly basis. And all CPI components showed stronger readings on an annual basis. However, the details also showed that Canada’s strong November headline CPI readings were driven mainly by the transportation component’s 1.6% month-on-month surge and 5.9% year-on-year jump. And transportation costs climbed rapidly because of higher gasoline prices (+7.4% month-on-month, +19.6% year-on-year). But again, inflationary pressure was broad-based, which is why two of the BOC’s preferred measures for underlying CPI printed increases. Specifically, trimmed mean CPI jumped from +1.5% to +1.8%. And the same can be said of median CPI, which accelerated from +1.7% to +1.9%. The only dark cloud in the CPI report was the common component CPI since it ticked lower from +1.6% to +1.5%. Overall, however, the November CPI report was pretty great. Most economists forecast that headline inflation fell by 0.3% month-on-month in December after rising by 0.3% previously. The annual reading, meanwhile, is expected to decelerate from +2.1% to +1.9%. In other words, economists are forecasting that inflation deteriorated in December. Do the available leading indicators offer any clues? Well, the prices index of the comprehensive December Ivey PMI report dropped from 67.7 to 62.5, which is still above the 50.0 neutral level. This means that Canadian companies reported higher input costs. Although the rate of increase slowed. Unfortunately, the Ivey PMI report only shows input costs and does not show if companies are passing on their higher costs to consumers. Markit’s manufacturing PMI report corroborates the Ivey PMI report since Markit found that “input prices increased sharply, but the rate of inflation eased from the three-and-a-half year peak seen in November.” Like the Ivey PMI report, however, Markit was silent on whether or not companies charged higher costs or lowered their prices to consumers. Hmm. Not much to be gleaned in terms of clues. Both Ivey and Markit reported that input costs rose further but at a slower pace, but no hints on whether this reflected on the prices of goods and services purchased by consumers. Okay let’s now move on to historical tendencies. And, well, there appears to be a historical basis for the consensus that headline CPI deteriorated in December since CPI also weakens between November and December, as can be seen below. However, economists also have a historical tendency to be too optimistic with their guesstimates for the monthly reading, resulting in a string of worse-than-expected readings. As for the annual CPI reading, there’s no clear historical tendencies between the months of November and December. As to how economists fared with their forecasts for the year-on-year reading, there’s too little historical data to work with. But what data we have shows three downside surprises to one upside surprise and one where economists got it right. In summary, the leading indicators don’t offer any real clues but they show that input costs weakened, which may (or may not) reflect on CPI. However, the consensus for a weaker monthly CPI reading has a historical basis. Moreover, economists have a strong tendency to overshoot their guesstimates for the monthly headline reading. Probability therefore appears to be skewed more towards the downside, at least for the monthly headline reading. But as mentioned earlier, we’re playing with probabilities here, so there are no guarantees that the actual monthly reading will surprise to the downside. Canada’s retail sales and CPI reports will be released separately this time around. Last time, however, the reports were released at the same time. And since both surprised to the upside, the Loonie reacted by spurting higher across the board. Anyhow, just keep in mind that traders usually (but not always) have their sights on the headline retail sales reading and the monthly headline reading for the CPI report, with better-than-expected readings generally triggering a quick Loonie rally while downside surprises usually have the opposite effect – a quick Loonie selloff. Other details of the retail sales and CPI reports, meanwhile, usually influence follow-through buying or selling. And since the BOC hiked recently while cautiously signaling that there will be more hikes to come if the Canadian economy continues to improve, then forex traders will be very likely using the upcoming retail sales and CPI reports to validate the BOC’s rate hike and gauge if the Canadian economy can handle more hikes, which increases the chance that there will be follow-through buying or selling. However, oil usually gets to dictate follow-through price action on the Loonie. So make sure to check real-time prices of oil futures here and here.